Open up your office space with the Segovia Glass Top Desk. The shadowbox-style desktop features a storage shelf under its tempered glass top, offering you all the space you need while keeping your office or study space open and relaxed. Elegantly minimalistic, classically modern, and infinitely adaptable, the Segovia Glass Top Desk is where you keep it all where you can see it. 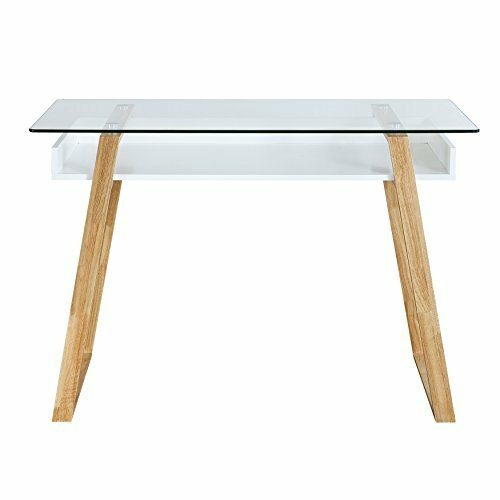 MODERN DESIGN - A glass top hovering above a sleek white shelf give the Segovia Glass Top Desk a wonderfully modern look to go in any home or office. Angled natural rubberwood legs complete the look with a pop of color and design. FUNCTIONAL - The minimalist design of the Segovia Glass Top Desk allows it to fit in almost any space. A 5" deep shelf below the spacious glass top gives you plenty of storage for anything you're working on. Whether you need space for your laptop, a new vanity, or just some extra surface space, the Segovia Glass Top Desk will fit your needs. DURABLE CONSTRUCTION - Sturdy rubberwood legs ensure that the Segovia Glass Top desk will stay balanced. An open MDF cabinet is covered with 8mm thick tempered glass for durability and safety. WARRANTY GUARANTEE - At Poly & Bark quality is our gold standard. We want furniture that lasts. We work with crafters that we know and trust - crafters who offer the level of quality we know our customers desire and deserve. While we don't limit ourselves to plastics and wood, we do insist on fabulous materials and high-end craftsmanship. Every product we sell comes with a 1-year guaranteed warranty.